The new Arri Alexa XT introduces built-in ArriRAW recording and an upgrade for existing Alexa owners. On Arri's web site, there is a link on the new Alexa XT cameras. And at Abel Cine, a short description. AlexaXT is a new range of cameras that provide ArriRAW recording within the camera itself. Using new magazines co-developed with Codex. 512 GB in one magazine, which can record about 55 mins ArriRAW. Download is with a new reader which has USB3 and one still will need to use the VFS software to get data off these magazines. Existing Alexa owners can have their cameras upgraded to the AlexaXT with this XR module which replaces the ProRes card module. So if the camera could record ProRes, it will now be able to record ArriRAW. If you still wish to record ProRes, you need an adapter that permits using SxS cards. Existing Alexa owners who have invested in Codex ArriRAW recorders, will have a dilemma. Continuing with the Codex recorder, will not fetch any additional rent once the XT Alexas become common. And definitely after existing Alexas without Codex recorders upgrade to the Alexa XT. Existing Alexa owners who have Gemini444 recorders are in a safer position. Their Alexa can do ProRes or Gemini ArriRAW depending on the production's budget. And they've had a lower expenditure to buy the Gemini which costed nearly half or less compared to the Codex Recorder. The new Alexa XT or existing Alexas with the XT upgrade also provide high fps shooting as standard and not a priced option as earlier. 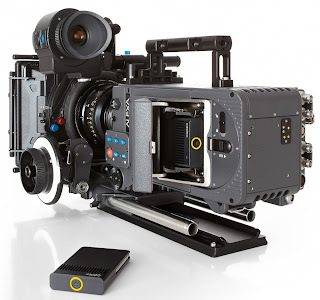 These upgrades coming so soon after the release of the Alexa Studio will mean that anyone investing in any high-end digital movie camera will need to recover their investment in as short a period as possible since manufacturers will introduce newer cameras and recorders in as less as one to two years. But for users it is a boon as they get access to better means of creating moving images at shorter intervals. Just like the F5 and F55 are an upgrade to the F65 at a lower price… but that's another story. Rods can take lens motors, matte boxes, follow focus etc. Separately available upgrades include: the XR Module, In-camera Filter Module IFM-1, Viewfinder Mounting Bracket VMB-3, Viewfinder Extension Bracket VEB-3, XT Fan and the anamorphic de-squeeze and high speed licenses.